I enjoyed my time at the Southern Baptist Convention Annual Meeting in Dallas. It was my first time getting to attend the annual meeting, although I have attended several of our state conventions here in South Carolina. I was there both as a student at Southwestern, and as a messenger from Putman. On Sunday afternoon we got to attend the Text-Driven Preaching Micro Conference led by Dr. David Allen. There was a panel of pastors and professors that make up the SWBTS School of Preaching, including Mac Brunson and Kyle Walker. Dr. Allen asked them questions and took questions from the audience. Sunday night began the Pastors' Conference where we heard sermons from Juan Sanchez, James Merritt, and Tony Evans. On Monday we were privileged to attend the closed-door questions and answers time with the members of the Executive Committee, which was very educational. Throughout the day I attended the other nine sessions of the Pastors' Conference, listening to Bryan Carter, Cameron Triggs, Jack Graham, Ray Pritchard, Frank Pomeroy, Robert Smith, Daven Watkins, Charlie Dates, and J.D. Greear. On Tuesday morning I got to observe open motions from the floor. That time slot can provide fireworks for the next day and a half, and it is the place where both problems and progress are born. As much as it can be a nerve-wracking time, it is necessary and a foundational element of the SBC. With millions of Baptists and thousands of messengers, it is incredible to think that any person can grab a microphone and speak, especially considering that the president has no indication as to what is about to be said. Motions should be submitted in writing prior to the convention, but sometimes issues come up after that deadline has passed. Two such issues occurred this year: the removal of Dr. Patterson and the late addition of Vice President Pence to the schedule. Several motions were made from the floor in light of these events. 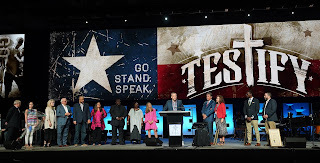 One motion was made that the SBC adopt a policy that says no person running for public office shall speak at future conventions; this motion included a concession that the local mayor or person of equivalent office can deliver a welcome as Governor Abbott did this year. Another motion was made that called for the immediate removal of each of the members of SWBTS’ board of trustees’ executive committee; a less severe motion was also made that would officially review the actions taken that precipitated the removal of Dr. Patterson. Each of these motions received a second and was moved on to the next phase. The motion involving politicians speaking to the convention will appear on the ballot in 2019, while the motions surrounding the SWBTS boards were set for debate and vote on Wednesday. After the debate was over the messengers overwhelming voted to keep the board of trustees, a decision I was glad to see. The other significant debate occurred Tuesday morning when we were voting on the next budget. A motion was made to amend the proposed budget in the book of reports to defund the Ethics and Religious Liberty Commission, which again I was glad to see overwhelmingly voted down. It was an honor to be able to raise my ballot in defense of these issues. While I may have personally found these motions to be misguided, it is the ability of any messenger to have equal say that makes the convention so strong. In the '90s a teenage girl once made a motion that led to adding events for teenagers during the convention, and this year a nine year old boy made a motion to add a new day to the special events calendar (Children’s Ministry Sunday), so it is true that every person has a voice. One part of the business I was looking forward to was the seminary presidents’ reports. I had been looking forward to it just as a Southwestern student, getting to hear a live report from my president, but the shakeup obviously added a new element to it. I have the utmost respect for Dr. Bingham, and I knew all eyes would be on him. As I knew he would do, he masterfully addressed the elephant in the room without throwing anyone under the bus. He was tactful and graceful. I think he may have filibustered for a few minutes knowing that he was going to be barraged with questions, and when they came he handled them very well. I also applaud the other five presidents for answering tough questions well and standing with Dr. Bingham; this could have been a time for competition among the schools, but it looked like teammates pulling together. While each of the reports was interesting, I think the most exciting was the International Mission Board report given by David Platt. After giving examples of how many things were heading in the right direction, he said, “In other words, the IMB is open for business.” That line drew applause because the IMB was in trouble just a few short years ago. Platt has done a great job, so I will be sorry to see him go; I did not know until he mentioned it his report that he is leaving to return to the pastorate, so I will be praying that a successor is found soon. The WMU, like Platt, shared stories that gave me goose bumps. It was exciting to hear about great things God is doing through Southern Baptists around the world. We also had to elect officers for 2019, as Steve Gaines concluded his second term this year. The Convention President for the annual meeting in Birmingham will be J.D. Greear, with First Vice President A.B. Vines and Second Vice President Felix Cabrera joining him. Stephen Rummage was elected to deliver the convention sermon, with Josh Smith on standby as the alternate. We also learned that 9,583 people served as messengers this year. While I am personally a big fan of Vice President Pence, and was opposed to the efforts to stop him from coming, I do have to say I was disappointed with his remarks. Much of what he said was appropriate for the occasion—speaking up for the unborn and moving the embassy to Jerusalem, and defending religious liberty, for example. But much of what he said was touting the Trump agenda on matters unrelated to the SBC and our core convictions. I feel that our convention was used as a campaign rally for Trump/Pence 2020, and I can certainly see why some would want to end speeches by elected officials. I am a Republican, but if Jimmy Carter, a Democrat Southern Baptist, wanted to speak, it would be an honor to see him, but I think that respect for the office is an endangered species. It seems these days people only respect leaders of their own party and vilify all others. I don’t think we will be having politicians come back any time soon. Alicia attended a pastors' wives session led by Beth Moore, and together we attended the Southwestern Alumni Luncheon on Wednesday (neither of us is alumni, but I will be in December and that was a requirement for one of my classes). We were challenged by the report from the North American Mission Board. While there is reason to celebrate the number of reported baptisms, the reality of declining membership exposes a problem. The challenge put before us was to refocus on discipleship, not just evangelism, and the 80by20 Challenge will hopefully help with that. NAMB’s research showed that only 45% of professing believers read their Bible at least once a week; the goal is to get that number to 80% by 2020. Dr. Gaines had a good line that I would like to include here. There was a lot of focus on the negative, like the NAMB report and the issues regarding the seminaries, but Gaines reminded us “There’s a lot more good going on in the SBC than there is bad.” It is good to keep that in mind.